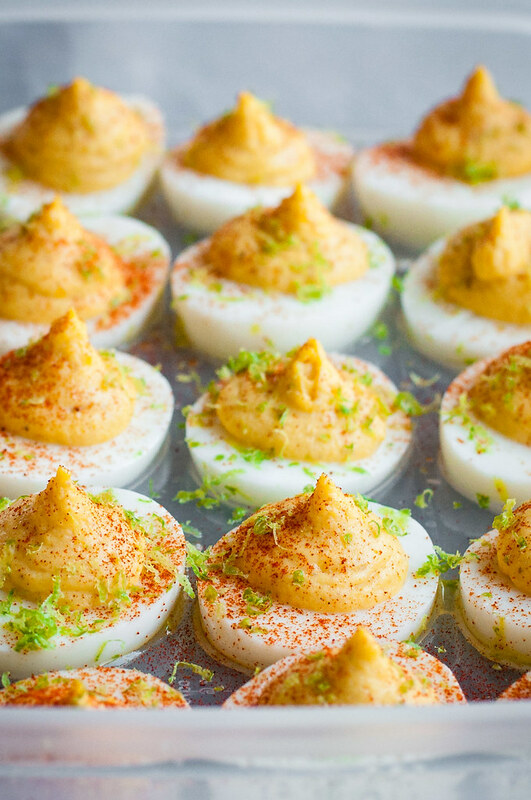 Easter is over, and I’m just now bringing you my new favorite deviled egg recipe. Timing isn’t always my strong suit. 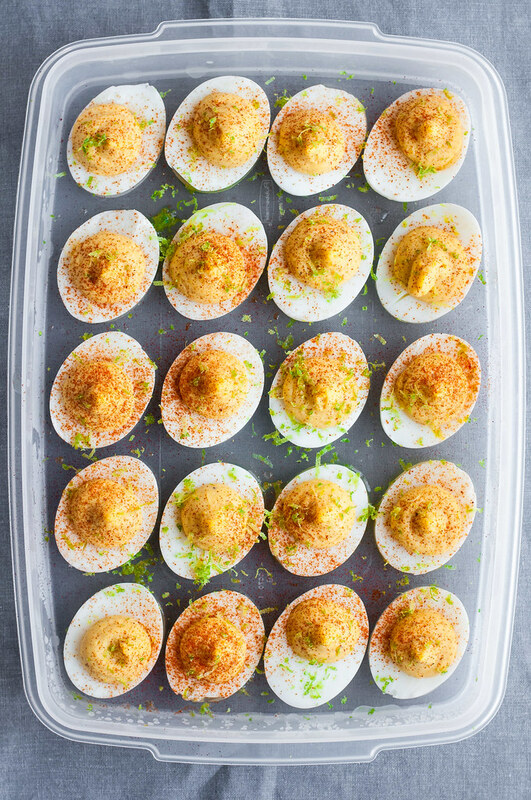 I will always be a sucker for the original deviled egg, when well prepared, but sometimes it’s fun to change things up just a bit. Like at the last major holiday, when Toryn and I plotted just how awesome the vegan chipotle mayo we bought at Wal-Mart would be in deviled eggs, instead of on the brisket sandwich condiment bar at Christmas. On a subsequent Facetime chat, we had virtual happy hour as we sipped wine and she put together the said chipotle deviled eggs, allllllll the way down in Oklahoma, aka, not anywhere close to my Connecticut home. I was so jealous! 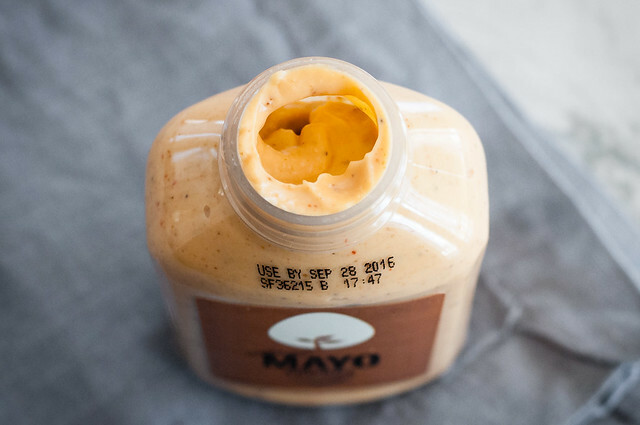 First, because she has a Wal-Mart down the street that carries this heavenly, spicy mayo for less than $4 a bottle (and I ordered mine for something like $10 on Amazon), and second, because she was about to have a tray of deviled eggs all to herself to kick off the weekend. Why hadn’t I planned like that??? Months later, I’ve finally acted on Tor’s genius idea, and I threw in a few highly delicious and complementary additions to the chipotle flavor. 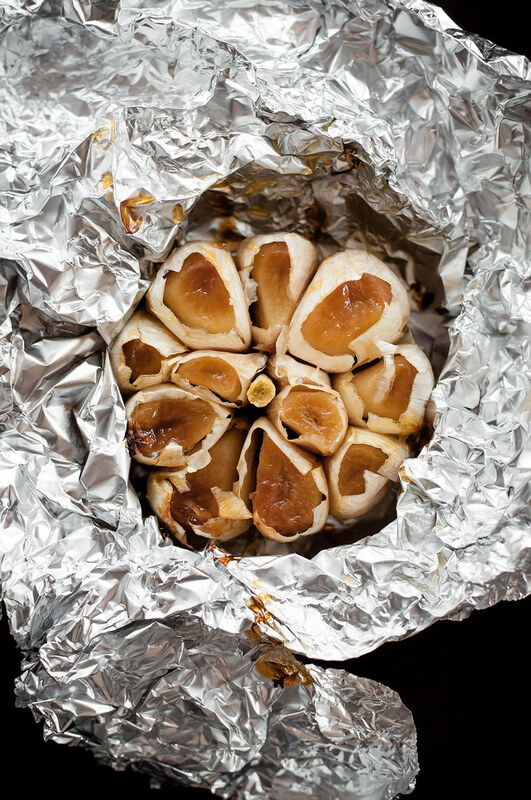 First, I roasted some garlic in the background of a million different kitchen tasks last Saturday. I didn’t include the roasting time for the garlic in the recipe cook time below, because you can really do it any time with under five minutes of prep. Just shy of an hour later, you have beautiful, sweet, golden cloves, no fussing or constant checking involved. Instead of adding sweetness to my deviled eggs by way of the more conventional sweet pickle relish, the roasted garlic adds a super subtle sweetness tinged with all the garlic flavor goodness and none of the pungent, breath killing raw garlic effect. Next, and this was one of those ingredients that came to me as I was drifting to sleep the night before testing the recipe, I replaced the perfectly acceptable, but a little tired, tang of vinegar with a squeeze of fresh lime juice, saving the zest for a colorful garnish that hints at what you’re about to bite into. Just note that it is much easier to zest a lime before juicing it. Don’t ask me how I know. Deviled eggs proved to be the perfect canvas for my flavor experiment, and I’m no longer jealous of my sister’s snack. I have my own huge tray sitting in the fridge, a husband who despises hard boiled eggs in any format, and the most fun addition to any meal, or just a snack all on its own. The only annoying part is having to remind myself that it’s highly irresponsible to down more than four of these indulgent bites in one sitting. But you don’t have to hoard them all to yourself. 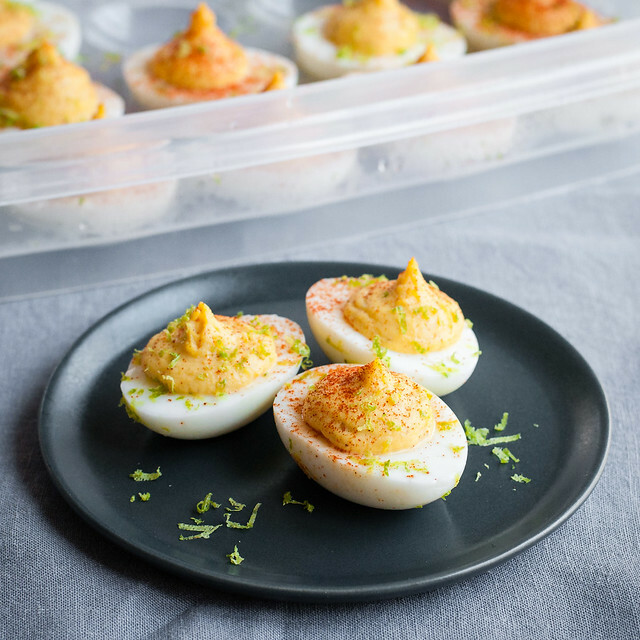 I may have missed Easter, but luckily picnic season is still upon us, and I challenge you to find a single picnicker, besides my hubs, who can turn down a flavor-packed, smoky chipotle deviled egg topped with that nearly neon lime zest. Gluten free/vegetarian. 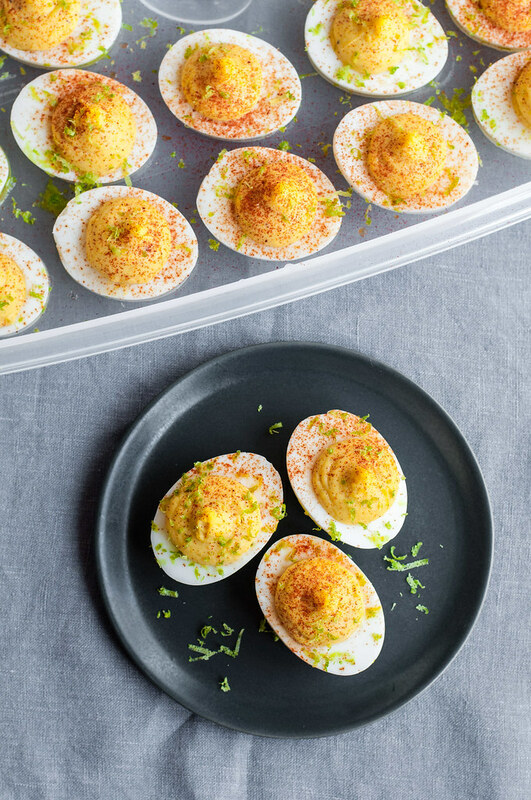 Deviled eggs are addictive enough on their own, but to really make them stand out on the potluck table, just add smoky chipotle flavor, a few cloves of sweet roasted garlic, and a pop of lime juice instead of the usual vinegar. Hard boil the eggs (more tips here). Place eggs in a large pot and cover by an inch with cold water, then set over high heat, uncovered. After the water boils for about a minute, turn off heat, cover the pot, and let stand exactly 17 minutes. Remove eggs to a bowl of ice water to cool for 5 to 10 minutes. Peel eggs and halve lengthwise, wiping off the knife blade with a damp towel between eggs, so the whites stay spotless. Set whites face up in a pan or deviled egg plate. Mash yolks very finely with a fork. 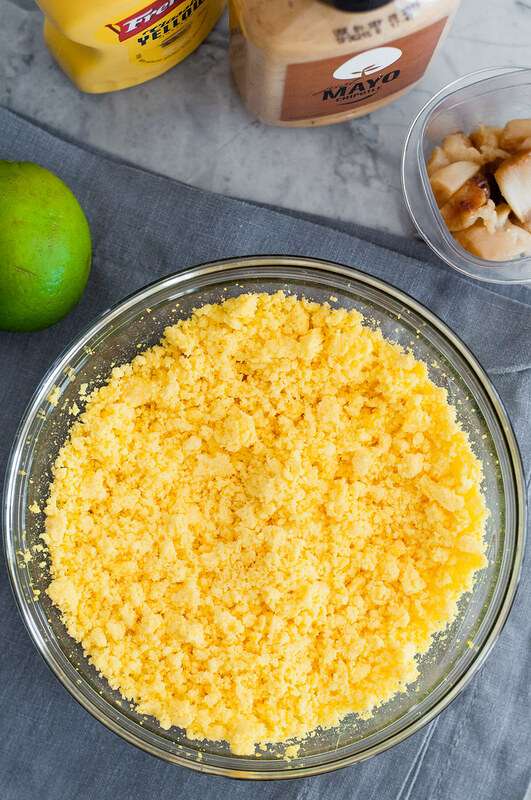 Stir in mayonnaise, mustard, garlic, and lime juice, then season with the salt and pepper, plus more to taste. Refrigerate yolk mixture before filling the whites, if time permits. Spoon yolk mixture into a sturdy zip-top bag or icing bag with or without an icing tip. If not using an icing tip, cut off about half an inch of one of the corners of the zip bag. Squeeze filling into egg whites. Dust with paprika and sprinkle with lime zest. If making ahead, wait to garnish until just before serving. The yolks from a dozen eggs generously fill 20 egg white halves. This leaves room for a couple eggs that look like a mess after attempting to peel them, just keep the yolk on those throwaways. Thanks Thalia! I always wonder why I wait so long in between making them, too. So yummy!